The church shall be engaged, “in equipping the saints for the work of the ministry, and for building up the Body of Christ, until we all attain to the unity of the faith and of the knowledge of the Son of God, to mature manhood, to the measure of the stature of the fullness of Christ, so that we may no longer be children, tossed to and fro by the waves and carried about by every wind of doctrine by human cunning, by craftiness in deceitful schemes. Rather, speaking the truth in love, we are to grow up in every way into him who is the head, into Christ, from whom the whole body, joined and held together by every joint with which it is equipped, when each part is working properly, make the body grow so that it builds itself up in love.” Ephesians 4:12-16 (ESV) So that in all things the congregation may bring Glory to God. 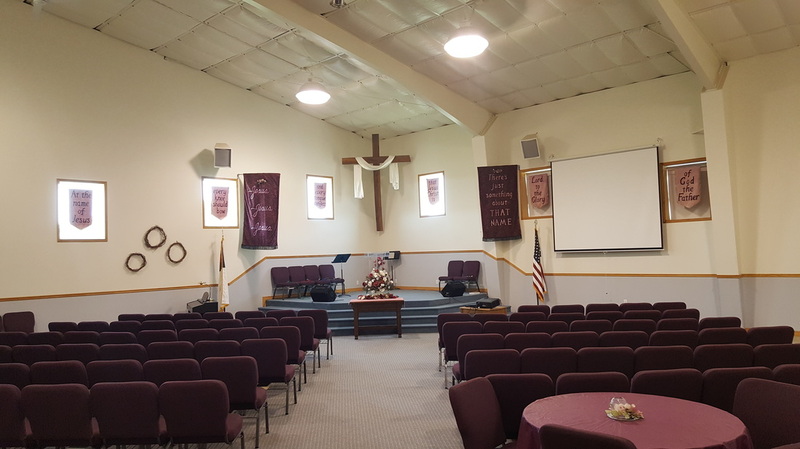 In New Testament Fashion, the Congregation will grow in the Grace of The Lord Jesus Christ to the end that souls may be saved, the family of God will be edified and the preaching of the Gospel of the Lord Jesus Christ will be heard by all. Teaching of The Word of God will be the central theme of the church and the church will administer the ordinance of Communion monthly and the ordinance of Baptism on a regular basis. We believe that there is one living and true God, eternally existing in three persons. God The Father, God The Son, and God The Holy Spirit and that they are equal in every divine perfection, and they execute distinct but harmonious offices in the work of creation, providence and redemption. We believe in God, the Father, an infinite, personal spirit, perfect in holiness, wisdom, power and love. We believe that He concerns Himself mercifully in the affairs of men, that He hears and answers prayer and that He saves from sin and death all who come to Him through Jesus Christ. We believe in Jesus Christ, God’s only begotten Son, conceived by the Holy Spirit. We believe in His virgin birth, sinless life, miracles and teachings. We believe in His substitutionary atoning death, bodily resurrection, ascension into heaven, perpetual intercession for His people and personal visible return to earth. We believe that all men are sinners by nature and by choice and are, therefore, under condemnation. We believe that all men need a Savior, and that God the Father gave His Son, The Lord Jesus Christ, to pay the penalty for our sin and to be our Savior. We believe that we are born again by grace, through faith, and not by our own doing. We believe Salvation is a gift of God, not the result of works, so that no one may boast. We believe that our regeneration (salvation) mentioned above is fully wrought by the work of the Lord Jesus Christ on the cross. His Work is sufficient to save all true believers everywhere throughout all time. All those who are saved remain saved forever by the unchangeable covenant of God’s Grace and the abiding presence of the Holy Spirit. We believe in the universal church; a living spiritual body of which Christ is the head and all regenerated persons are members. We believe in the local church, consisting of believers in Jesus Christ, associated for worship, work and fellowship. We believe that God has laid upon the members of the local church the primary task of giving the gospel of Jesus Christ to a lost world. We believe that a Christian should live for the glory of God both in private and in public, in vocation and in worship; to serve the well-being of his community, country, and world; that he should be a faithful steward of his possessions; that he should walk in all matters of life in a manner worthy of the calling to which he has been called; and submit to the providential work of grace in his life to realize the full stature of maturity in Christ, for God’s glory and the benefit of His Church. We believe that the Lord Jesus Christ has committed two ordinances to the local church; baptism and the Lord’s Supper. We believe that Christian baptism is the immersion of a believer in water in the name of the triune God. We believe that the Lord’s Supper was instituted by Christ for commemoration of His death. We believe that these two ordinances should be observed and administered until the return of the Lord Jesus Christ. The ordinance of Communion should be done at least once monthly (First Sunday of each month), and the ordinance of Baptism scheduled to facilitate each person’s spiritual witness of Faith in Christ. We believe that every human being is accountable to God, and is responsible to God alone in all matters of faith; that the church is independent and must be free from interference by any ecclesiastical or political authority; that therefore Church and State must be kept separate as having different functions. We believe in the imminent return of the Lord Jesus Christ from heaven to deliver the Church unto Himself. After a seven-year period of Tribulation upon the earth we believe in the personal and visible return of the Lord Jesus Christ to earth and the establishment of His kingdom. We believe in the resurrection of the body, the final judgment, the eternal life of the righteous, and the endless suffering of those who reject Christ as Savior and Lord (unbelievers). We believe that Satan is a created being and that Hell is a place of eternal conscious punishment. That Satan was created with might, as an angel, second only to God. That he rebelled against God and led angels, now known as demons, to fall with him. His demons take their orders from him, he is in authority over the unsaved, comes in conflict with the believers, is a liar and the author of lies. His final doom is the lake of fire.